This page houses maps produced by the author. Right now it includes only three of the many I've made (some others appear in my dissertation). 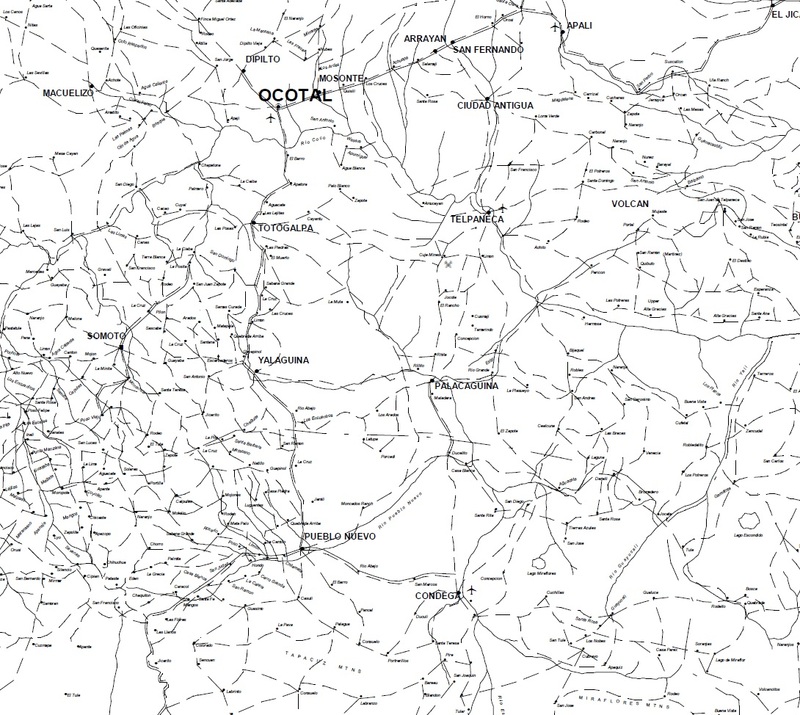 The most substantial is the PDF file of the digitized version of the 1934 US Army map, which took about six months to create — cutting the 1934 map along its gridlines into sections of 30 seconds square (0.5º longitude & 0.5º lattitude), taping sequential sections to a manual digitizing tablet, and using the software MapInfo 2.0 to reproduce as accurately as possible all the text & symbols in the original. Chunks of this map have been extracted & turned into JPEG files, and appear immediately below the big PDF map. 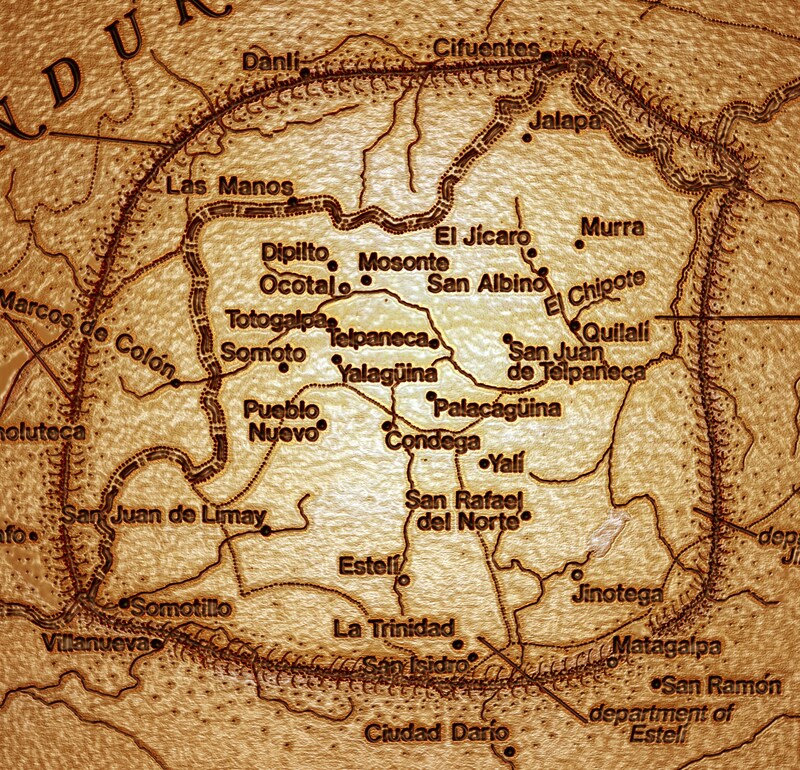 The second map, showing Las Segovias, was made in the pre-digital age using a pen and rub-on letters (and a fair amount of liquid paper; photoshopped detail at right). The third shows the airfields built in Western Nicaragua during the US occupation. Map 1. Zoomable PDF file of a digitized version of the 1934 US Army map, made using MapInfo Professional 2.0 with a manual digitizing tablet (a separate page is devoted to this 1934 map, HERE). © Michael J. Schroeder. Map 1A. 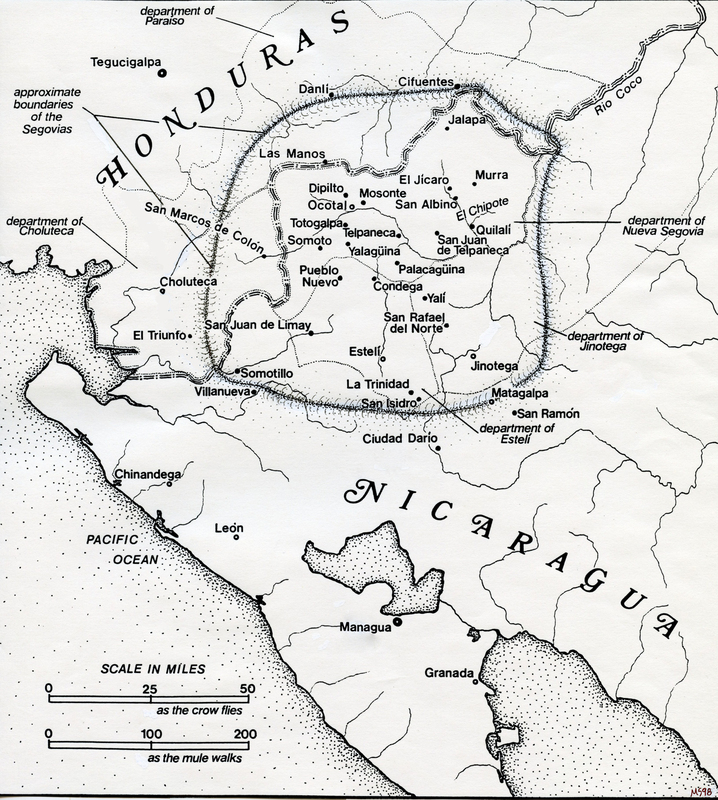 Ocotal-Condega Area. Chunk of the above PDF/MapInfo map, made using "Tools > Select & Zoom > Snapshot Tool". This & the map to follow included only as examples; the problem is that turning a chunk of the PDF/MapInfo map into a JPEG file means lower resolution when you zoom in. © Michael J. Schroeder. Map 1B. Matagalpa-Jinotega Area. 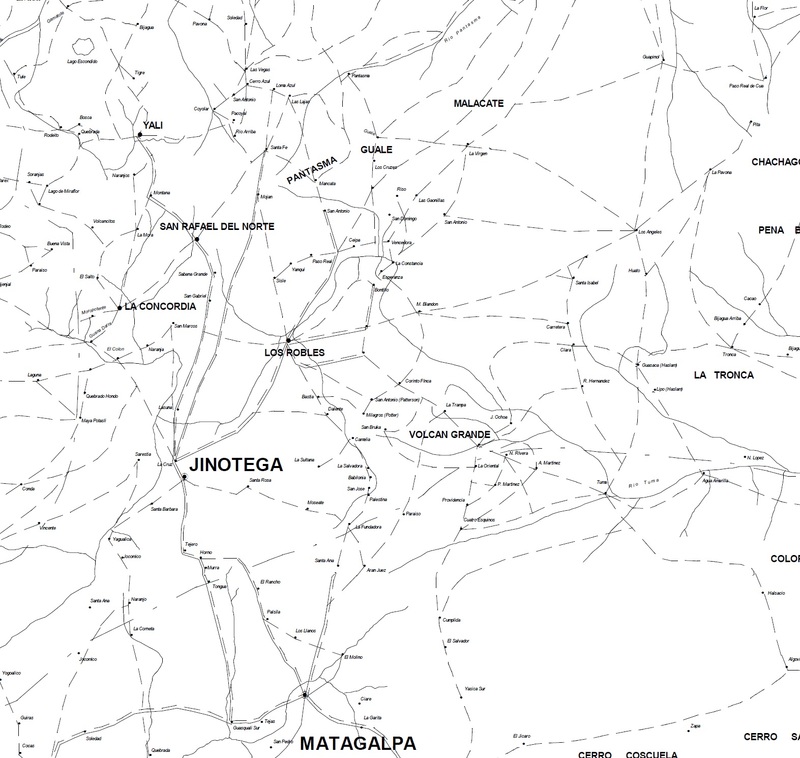 (Chunk of the above PDF/MapInfo map.) © Michael J. Schroeder. Map 2. Las Segovias in Western Nicaragua (scan of original map made using rub-on letters & a fine-point black pen, along with a fair amount of liquid paper). 4.5 MB. © Michael J. Schroeder. Map 2A. Las Segovias in Western Nicaragua, Photoshopped Version #1. 6.2 MB. © Michael J. Schroeder. Map 2B. Las Segovias in Western Nicaragua, Photoshopped Version #2. 10 MB. © Michael J. Schroeder. Map 2C. 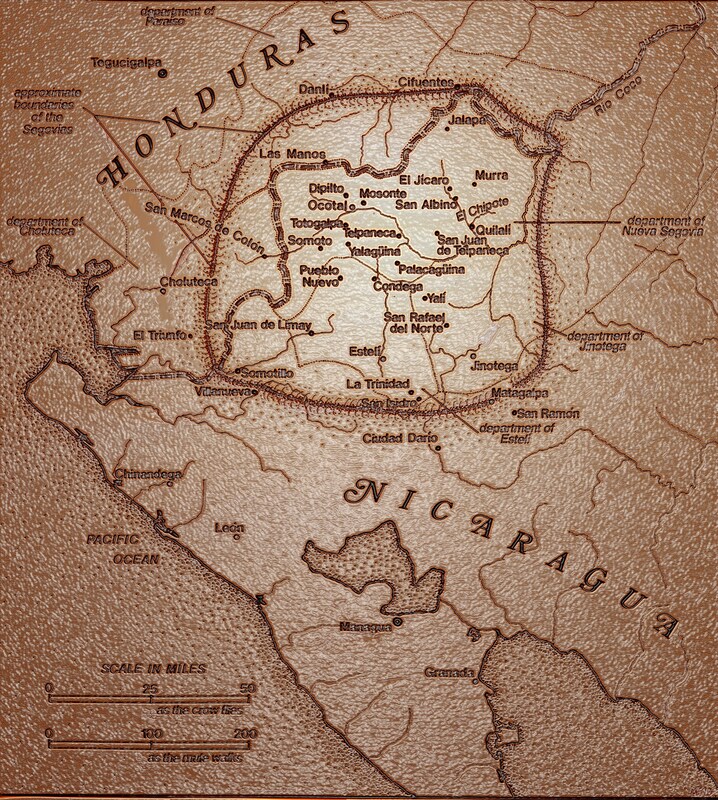 Las Segovias in Western Nicaragua, Photoshopped Version #3. 12.7 MB. © Michael J. Schroeder. Map 2D. Las Segovias in Western Nicaragua, Photoshopped Version #4. 4.1 MB. © Michael J. Schroeder. Map 2E. Las Segovias in Western Nicaragua, Photoshopped Version #5. 4.8 MB. © Michael J. Schroeder. Map 2F. Las Segovias in Western Nicaragua, Photoshopped Version #6. 1.4 MB. © Michael J. Schroeder. Map 3. 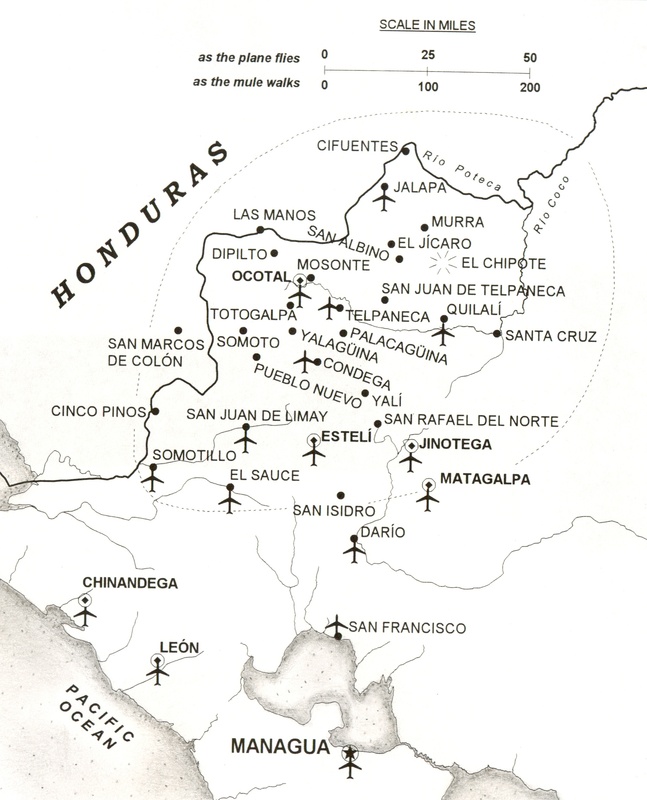 Las Segovias and adjacent zones, showing airfields built 1927-1934. Adapted from US Army Map, Geographic Intelligence, Military Intelligence Division (G-2), 1934. 1.5 MB. © Michael J. Schroeder.